Does anybody believe ANYTHING he says nowadays? President Donald Trump went off-script at the UN General Assembly general debate after the audience erupted in laughter to his claim that in less than two years his administration has accomplished more than almost any administration in the history of America. 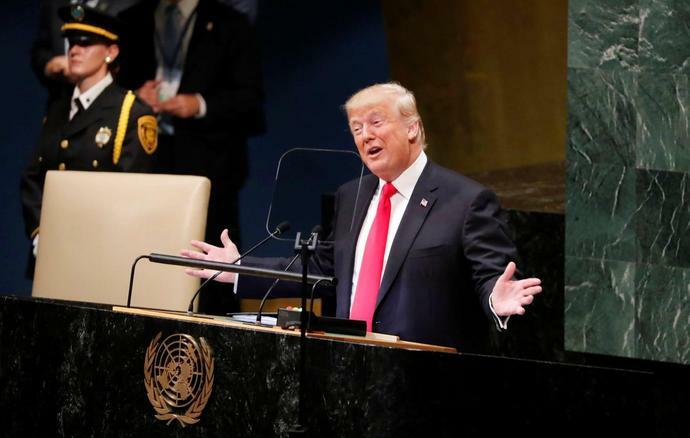 UNITED NATIONS (AP) — President Donald Trump delivered a sharp rebuke of multinational authority at the United Nations on Tuesday, drawing headshakes and even laughter from fellow world leaders as he boasted of America’s economic and military might. Trump arrived late, forcing a last-minute scheduling switch, then received polite applause but also blank stares as he took his blustery brand of “America First” policies to the annual General Assembly. Edited 2 time(s). Last edit at 02/04/2019 02:34PM by Steve G..
How great the country is doing because he (Cheeto) is president. All the drugs, criminals and bound & gagged taped women in cars flowing across the border. I will not listen to it. It will be painful, but it's piece of real rotten American history few have witnessed before. A landmark. You will be amazed how incoherent, hate-mongering, divisive, exaggerated and larded with overblown baseless fantasies his rant will be (believed by his gormless followers.) Listen to the whole thing. Trump is more horrifying than any mere description can be. Word is the President is bringing some of his fans to the House Gallery and they have been practicing Trump favorites: Build the Wall, Lock Her Up and Drain the Swamp. Me,neither. I'll wait for the movie.